This painting belongs to the genre of surrealism and was painted by the artist in 1794. The painting “The Great Architect” expresses a bright range of religious feelings of Blake – this painter was one of the supporters of the theory of creationism. The enigmatic picture belonging to the English mystic poet, like all his creations, was first forgotten, but now it causes a lot of conjecture, it is analyzed and interpreted. This picture is kept in the British Museum. In this work of art first of all strikes an unusual image, which the artist uses to interpret his design. And this picture is called “The Ancient of Days”, which literally translated from English means “Ancient days”. These words denoted the name of God in different world religions. The main character of this picture is God, and he is depicted at the time of creation, he does not establish order, but limits freedom and limits of imagination. Religion and faith, laws and order that they establish are always present in the work of this poet, they were the subject of his reflections. And in this picture, Blake touched on religion. Most of all features in this picture from the Old Testament Yahweh. The old days mean the immortal. Most often this name in the world of Christians is associated with the God-father, but sometimes this name denoted and God the son. The dilapidated days of Blake are not traditional for orthodox Christians. The artist depicted him against the background of the Sun, making us remember the pagan gods of the demiurges, he is concentrated, and his features show anger. In addition to the Old Testament Yahweh, this image is also associated with the demiurge of the Gnostics. But it becomes more difficult to understand this because of Blake’s own statements: “All religions are the same.” Apparently, he wanted to say that they are all manifestation of the best qualities of a person. Maybe because, and the Ancient of days depicted in his picture creates with his left hand for good reason. But the most likely is that in this picture Blake portrayed Urizen, whom Blake himself invented, it was the fruit of his own mythological imagination. Urizen, he often described or portrayed as an old man with white hair, sometimes he had the tools of an architect: Uriizen is the creator of the world. This is indicated by the translation of the name of the painting into Russian: it is known more in our country under the name “Great Architect”. 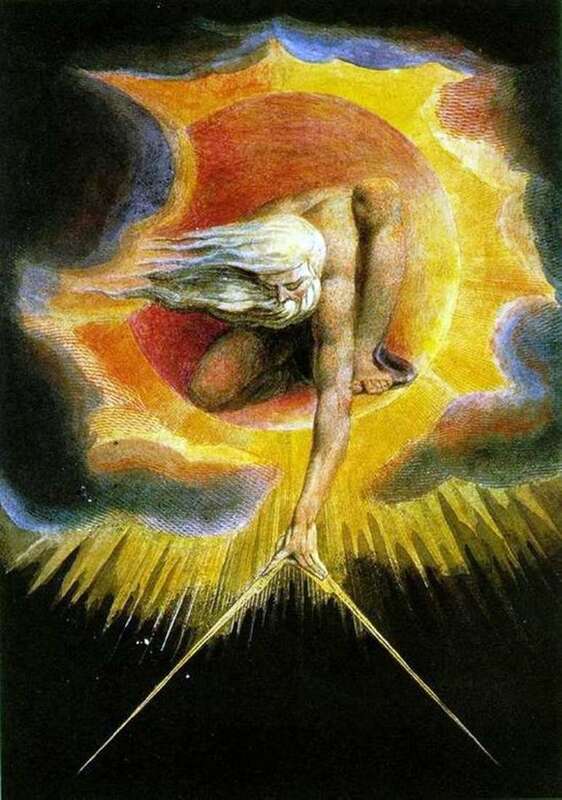 Description and meaning of the painting The Great Architect (The Creation) by William Blake.